Fighting God is a firebrand manifesto from one of the most recognizable faces of atheism. 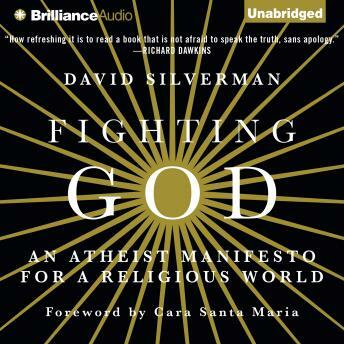 In his audiobook, Silverman-a walking, talking atheist billboard known for his appearances on Fox News-discusses the effectiveness, ethics, and impact of the in-your-face-atheist who refuses to be silent. -All religion is cafeteria religion and all agnostics are atheists. -American society grants religion a privileged status, despite the intentions of the Founding Fathers. -Christian politicians have adversely (and un-Constitutionally) affected our society with regard to science, health, women's rights, and gay rights. -The notion of 'atheist Jews' is a lie forced on us by religion. -It is not 'Islamophobia' to observe dangerous teachings and disproportionate violence in Islam. -Atheists are slowly but surely winning the battle. Fighting God is a provocative, unapologetic audiobook that takes religion to task and will give inspiration to non-believers and serve as the ultimate answer to apologists.